With the aging of each generation of musicians comes the birth of singers and artist in another. As the Beyonce’s and Celine Dion’s of the world grow older and take a conscious step back from music, younger artists rise to the call to lead the charge on the form of art that has existed for centuries. 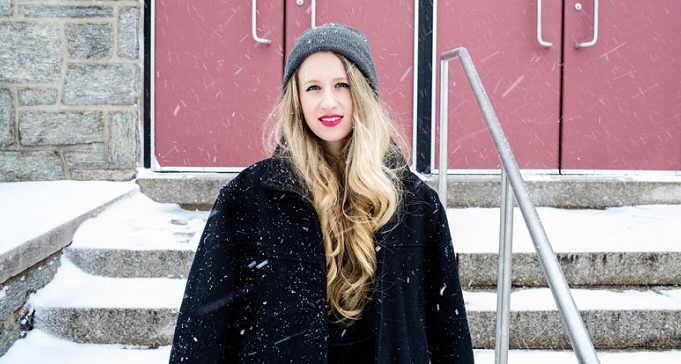 One of the young people answering this call is Samantha Gongol, one half of the music group – Marian Hill. Samantha Gongol is a vocalist who, within a short period of time has achieved milestones such as singing the National anthem at a nationally televised sports game, releasing two albums both of which debuted on the US Billboard Chart. By every metric, Samantha is talented enough to last a long time in the industry, like some of her predecessors in the art. This is why we’ve chosen to explore a little about who she is and her career so far. Read on. The emerging singer with the sultry voice, Samantha Gongol was born on the 14th of April, 1990 in Bryn Mawr, Pennsylvania. She was born Samantha Lee Gongol to parents whose identities are so far, unknown. Among the details unknown about her childhood is information regarding her siblings. Samantha Gongol began her education at Haverford High School, and it was there she met her friend and music partner, Jeremy Lloyd. While there, their joint passion for music caused them to start writing music together. After High School, Samantha went to New York University where she studied music business. Although higher education separated Samantha and her friend physically, their collaboration did not end. They wrote their first song, Whisky together and it was released as part of their EP (Extended Play), Play, in 2013. This EP introduced them to the world and they followed it up with another EP, Sway, which was released in 2015. For the music group, Marian Hill, Samantha Gongol is the vocalist while her partner, Jeremy Lloyd is the production artist. They released their first album in 2016, on the 24th of June and it was titled Act One. The album peaked at number 42 on the US Billboard 200 and number 3 on the US Alternative Music chart. Their second album was released on the 11th of May, 2018. The album was titled Unusual. Since Samantha Gongol came onto the music scene, she has performed and appeared on different late night television shows, including The Tonight Show Starring Jimmy Fallon, Conan and The Late Late Show with James Corden. Marian Hill has also written and produced soundtracks for a couple of projects, including the Fifty Shades Freed film. As a member of Marian Hill, Gongol has had the chance to collaborate with artists like Big Sean, Steve Davit and Lauren Jauregui. She and her partner are currently signed to Republic Records. With the advent of music streaming services, the music business is not as lucrative to artists as it once was, particularly emerging singers. However, with the talent at the disposal of Samantha Gongol, which has gotten her and her group various concert gigs, she has been able to accrue a modest net worth in the region of $500,000. With every expectation being that Samantha will continue to improve and release new songs for her fans and new listeners, there is every possibility of her net worth growing in the future. When you make music that makes people want to get frisky with their partner, people are bound to think the music comes from a place of experience, which is why there have been strong rumors of Samantha Gongol and Jeremy Loyd being in a relationship. However, that could not be farther from the truth, and if it is, that is information that has yet to be confirmed by the duo. So far, all we know of Samantha Gongol is she is publicly single and currently focusing on her career, which is on a fast rise. Samantha Gongol has one of the unique voices in modern music and she has the body to go along with it. At a height of 5 feet 7 inches, combined with a body weight of 53kg, Gongol has a body well-defined enough to command the stage and hold her audience in a spell as her mouth rolls out the note of every lyric. In further complement of her body are her blonde hair and blue eyes.